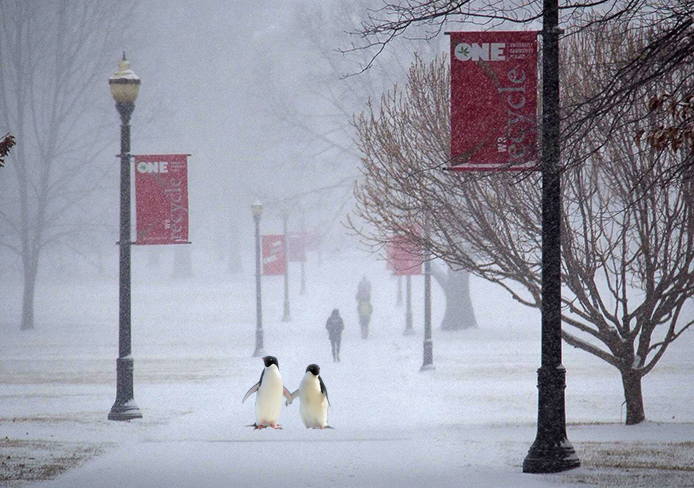 It’s getting cold here in Columbus, Ohio; and I will be honest, I have definitely complained about trekking to class. But complaining isn’t going to keep me warm. So I’ve decided to make a list of the reasons winter is actually kinda awesome. 1. Campus is pretty beautiful in the snow. Especially the oval. 2. As long as it is still snowing, I can remain in denial about my upcoming date of graduation in the spring. 3. Hearing stories about other states freaking out from a few snow flakes reminds me how tough we are here in Ohio. 4. Coming home to a warm apartment and a warm cup of coffee or hot chocolate makes a perfect after-class activity. 5. Napping in my warm apartment all curled up in blankets on the couch is also a great way to pass the time. 6. Winter activities! For instance, my friends and I rented a cabin in Hocking Hills. We built snowmen, sat in a hot tub watching the snow fall, and played card games next to a roaring fire. 7. I have an excuse to buy as many cute scarves as I can handle. 8. I get to wear my Doc Martens everyday. 9. My parents send me lots of cute pictures of our puppy, Ross, in the snow. If he loves playing outside in this weather, what have I got to complain about? 10. We’re all going to be complaining about the heat in six months anyways. Summer’s heat or winter’s cold was definitely an accurate lyrical choice for Carmen Ohio. I hope everyone is staying warm. Remember it’s going to be spring soon!